As early as 1924, the Overton County Board of Education authorized money for pupil transportation. Irvin Allred was the first to be employed by the Board of Education for that purpose and was paid "at a price not to exceed $2.50 per day." His route covered approximately four miles that lay between the Johnson Hollow school to Henard, a small school located near Bethlehem on the Livingston-Monterey highway. There were fourteen students transported that first year. The method used was a farm wagon and a team of mules. The wagon had side boards, and during cold, rainy weather, a tarpaulin was placed around arches to provide shelter. The front of the tarpaulin was left open so the driver could sit back in the wagon and use the same shelter as the children. During the winter months, the driver had to leave home before dawn in order to deliver the children in time for this first class. He would travel about an hour before he reached the homes of the first riders. It would then take about two hours to complete the trip to the school house. According to three persons who rode the first wagon, Ray Bilbrey, Nova (Allred) Bilbrey, and Floyd Huddleston, straw was placed about six inches deep over the floor of the wagon. The riders would sit in the straw with their backs against the side boards. The straw provided a soft cushion and gave some warmth from the cold weather. According to these riders, the wagon was frequently referred to as the "trash wagon." Before the big yellow school buses came along, this was one the early ways children were transported to school. for them to spend the night with the closest relative or in the home of a family friend. this method, then a limb was used. Mr. Allred was the only person to transport pupils during the school terms of 1924-25. In the school years 1925-1928, Mr. Allred was replaced as driver by Oren T. Huddleston. Mr. Huddleston drove the wagon for approximately the next three years and transported the children over the same route as Mr. Allred. According to records from the superintendent's office, both drivers received approximately $50 per month for the four years that the wagons were used. bed. Steps were erected at the end of the bed to assist the riders in getting off and on the truck. During periods of time when the truck was not used for transporting pupils, it would be used to haul both livestock and wood. The driver would thoroughly clean the bed before using it again to transport the pupils. The roads over which the truck traveled were dirt and gravel. During days when the roads were impassable by truck, the driver would contract wagons to transport the pupils. 1940. After that date, the steel buses were placed into operation. At one time, Overton County operated Long View school on Spring street in Livingston, a one teacher school for black students in grades first through eighth. The black high school students were transported on a Clay county school bus to Darwin High School in Cookeville. Long before transportation was provided to students living out in the country, Lorene Richardson Combee remembers how walks to school from Mohawk Valley to Lone Maple in the Taylors Crossroads community would include short cuts through the woods and neighboring fields. Emogene Sells Ledbetter, one of eight children, told me how snow days were unheard of when she and her brothers and sisters were in school at Plain Grove, (Possum Trot) a school just over the Pickett county line near Taylors Crossroads. She said they went to school regardless of the weather and sometimes put socks over their shoes in snowy weather. The walk from the Sells home to Plain Grove was at least three to four miles. 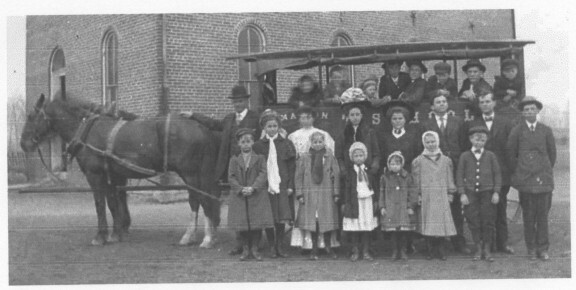 Evidently it wasn't until 1940 that transportation for school children was provided for the entire county. Up until that time, it seems that only one part of the county received the benefit of having a way to get to school other than walking. Even though life was much more difficult before modern ways of transportation came about, one thing can certainly be said, good wholesome exercise was definitely included, not just in walking to school, but in everyday life of families, something we could all certainly benefit from today, especially our children and grandchildren. There are indeed a lot of good things to be said about the good ole days!